WESTMINSTER – Archbishop William E. Lori made it to Carroll County’s only Catholic school Jan. 31 to visit the students of St. John School after a snowy morning cancelled his trip to the recently merged St. Michael-St. Clement School in Overlea the day before. Parents and students gathered for a Mass celebrated by the archbishop, complete with music by St. John’s School Choir. One class, in particular, had been preparing for his arrival. 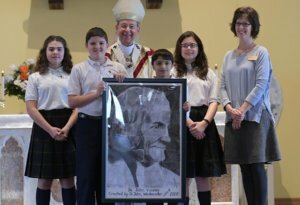 At the end of Mass, representatives from the sixth grade gave the archbishop a charcoal drawing of St. John Vianney, one of his favorite saints. It took the students only one class to create the depiction, which was comprised of multiple small squares. 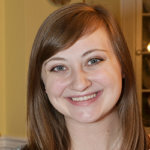 Clare Hoerl, the school’s art teacher, laid a grid over a picture of the saint and each student received a section of the portrait to complete, to make the project less overwhelming. Hoerl said that in math, two plus two always equals four, but art allows students to explore their creativity. In addition to the archbishop’s gift, St. John students prepared for Catholic Schools Week by creating clay portraits of their teachers, including the priests at the parish. 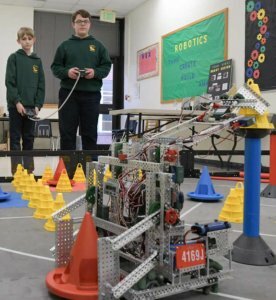 St. John is not only making great strides with art – the pre-K-4 to eighth grade school’s robotics team took home the highest honor Jan. 27 at a VEX Robotics Competition qualifier at Loyola Blakefield High School in Towson, where they were up against prominent high schools such as Calvert Hall College High School, Loyola Blakefield and Hereford High School. The team is led by advisor David Magaha, and includes three seventh-graders from St. John: Christopher Magaha, Timmy Burke and Jake Burman, along with Magaha’s daughter Alyssa Magaha, who is a junior at Delone Catholic High School in McSherrystown, Pa. This was the team’s second year in the VEX Robotics Competition; prior to that, the team used Legos. The Excellence Award is given to a team that is a strong contender in all award categories and that has created a high-quality robotics program. Jo Marie Tolj, who has been principal at St. John for about a year and a half, gives credit to the school’s teachers for their commitment. Currently serving 239 students, the school hopes to increase that number to at least 300. In addition to adding a pre-K-3 class next fall, the faculty and staff are reaching out to the edges of the county. Father Mark Bialek, pastor, celebrated Mass at St. Joseph in Sykesville Jan. 28 to promote the use of St. John as a school for all of the parishes in the region.